Facebook can be a powerful online marketing strategy, especially for small businesses that need to rely on personality and interaction over digital reach. However, it can also be an ineffective waste of time. Like any marketing tool, it’s all in how you use it. If your company is on Facebook, but you’re not realizing any impact on your marketing through social media efforts, take a look at your strategy to see if you’re making these common Facebook business mistakes. Some businesses set up Facebook pages with beliefs that are apparently similar to Kevin Costner’s character in Field of Dreams: “If you build it, they will come.” Once the page is created, they believe that people will find it on their own and become fans. Unfortunately, this doesn’t happen (unless you’re Kevin Costner). Keep in mind that successful Facebook marketing is a strategy. It takes time to build an audience—and once it’s in place, you have to continually expand and engage with your Facebook fans to convert them from part of your social network, to active brand ambassadors or paying customers. Another common “set it and forget it” mistake is automation. Sure, it’s great to set things up so your Twitter feed and business blog entries automatically post to your Facebook page. But if that’s all you do with Facebook, your fans will lose interest fast. Having a fully automated presence says that you’re not invested enough in your audience to interact with them. Quite a few Facebook marketers work with the underlying concept of using the social media network to make money. As such, their feeds are a steady stream of try this, buy that, now on sale, look what’s great about—basically the same standard messages used for banner advertising and Google AdWords campaigns. Broadcasting is a big mistake, and it’s one that many businesses make. Facebook is social media, and the operative word is “social.” Fans engage with businesses looking for a more personal connection with a higher degree of interactivity than companies offer on websites and in advertising channels. And when they don’t feel you’re being authentic, they’ll ignore your page—or unlike it. Sharing content is the core concept of Facebook. With billions of people using the network every day, there is indeed plenty of content being shared. This means that if you’re making one of the common Facebook post mistakes, it’s really easy for your fans to find other pages that are posting things they do like. Don’t be boring. When posting content to your business page, share content that is interesting, useful, and entertaining. This not only increases engagement, and Facebook likes but also encourages fans to share your posts with their friends, which can grow your audience. You should also avoid being predictable. Facebook has enough tools and features to help you turn your page into a multimedia experience—so don’t post a steady stream of status updates, or photos, or video content. Mix things up, and keep your fans guessing about what you’ll post next time. Effective Facebook marketing is as much about what you don’t do. 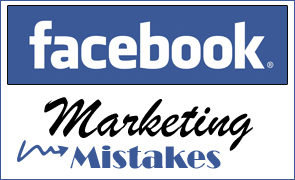 So steer clear of these common marketing mistakes, and watch your Facebook business page take off!